Oftentimes, it’s a major life event that prompts homeowners to start exploring renovation projects. Adam and Staci began planning their exterior home improvement project right as their son entered his senior year of high school with the goal of having it completed in time for his graduation party. On their wish list was updated siding, decking, and windows. In terms of priorities, their focus was on materials that were maintenance-free and attractive. Here’s the winning combination they chose! Deck: When the couple moved into their home five years ago, both of the decks were wooden and required frequent staining. Ready to be done with this chore for good, they started researching composite deck designs and materials. Ultimately they selected Zuri® Premium Decking by Royal®. This maintenance-free material exudes the refinement of exotic woods. Ultimate peace of mind is offered with the 25-year Color Fastness Warranty. The color the couple selected for both decks was Brazilia, which proved to be the perfect counterpart for their newly installed wooden garage door. 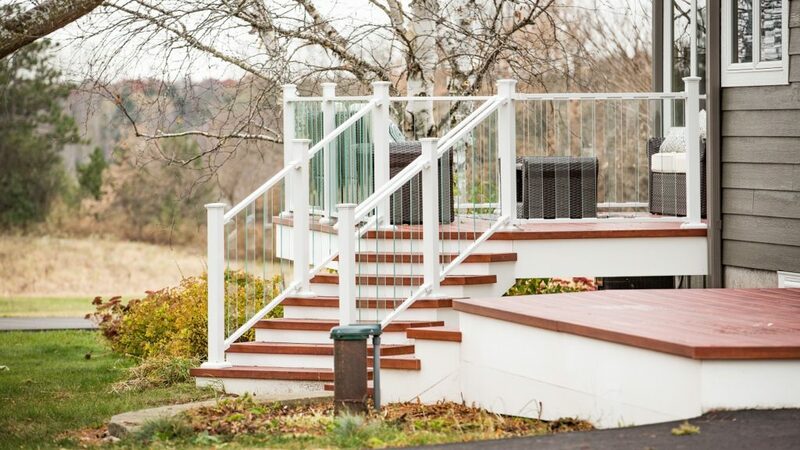 Wanting a railing system that was a show-stopper, they selected a Fortress™ railing with Pure View Glass. Siding: Knowing that the blueish gray steel siding on the 1980’s era home was on its last leg, the couple began weighing their home siding options and colors. Taking inspiration from their rural surroundings, Adam and Staci chose to use a combination of materials to create their desired look. For the majority of the home, LP® SmartSide® prefinished with Diamond Kote® in Terra Bronze was used. 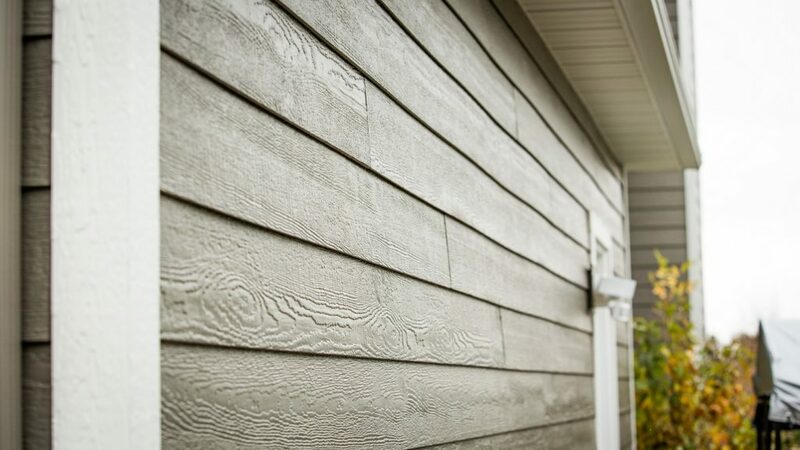 LP® SmartSide® is one of our top selling siding materials because of its impact resistance, superior moisture protection and strength, and resistance to fungal decay. 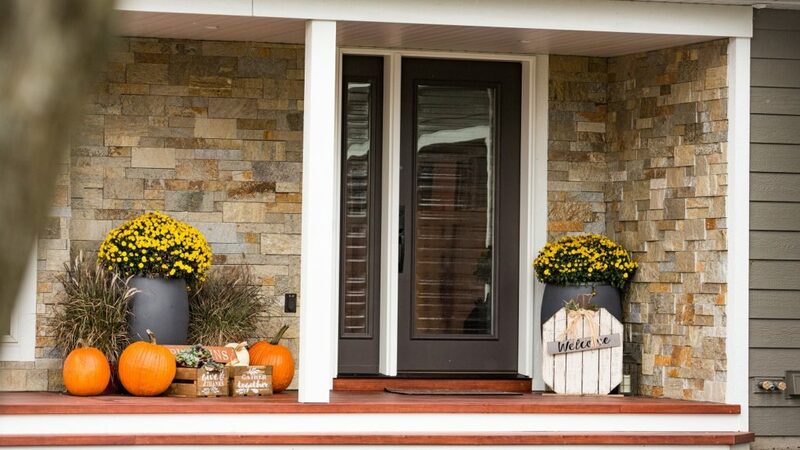 In order highlight their home’s front entry, the couple opted to have Copper Ledgestone™ natural stone veneers installed. Windows & Doors: Understanding that replacing windows and siding in tandem produces optimum results, we worked with Adam and Staci to evaluate their home’s windows to determine if any needed replacement. Those with broken seals, which were sacrificing energy efficiency, were replaced with Infinity® by Marvin® windows. Comprised of Ultrex® which is eight times stronger than vinyl. Although it replicates the look of wood, it requires substantially less maintenance. 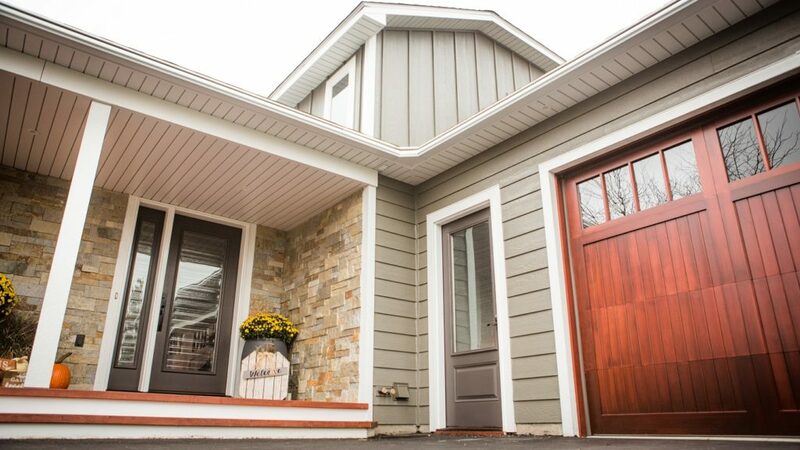 The home’s front and garage entry doors were replaced with doors with better insulation properties made by Wadena. Glacier glass packs were used to promote energy efficiency. 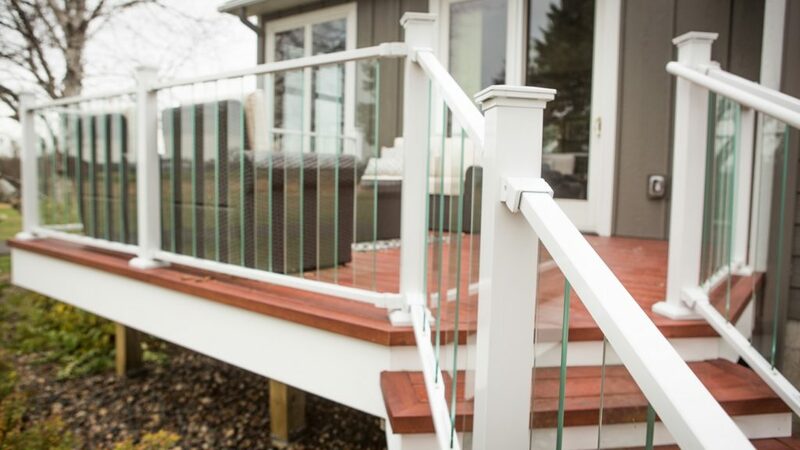 The Fortress™ railing with Pure View Glass was a show-stopper they selected. 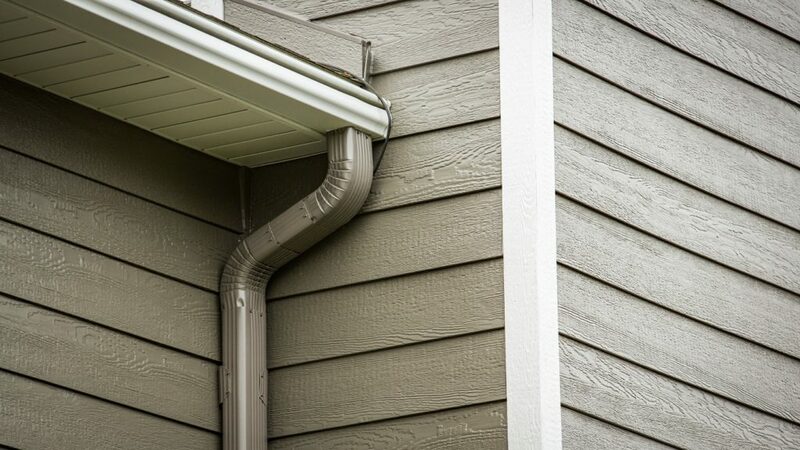 LP® SmartSide® prefinished with Diamond Kote® & LeafGuard® Brand Gutters proved to be a winning combination. 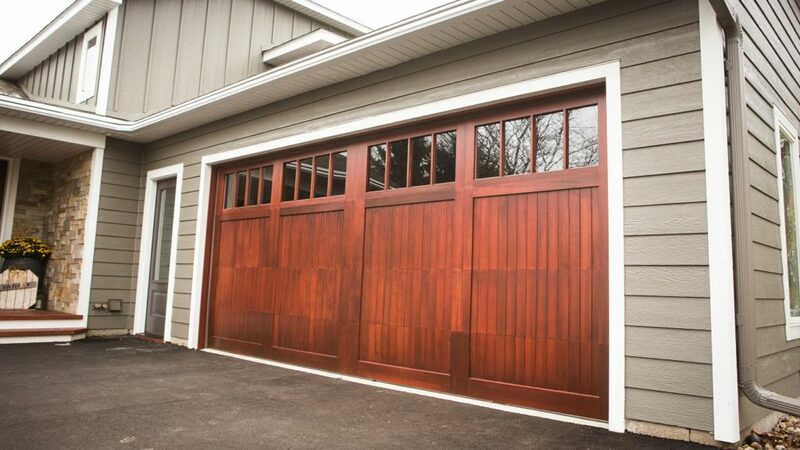 The home’s wooden garage door is a beautiful accent to the LP® SmartSide®. In order highlight their home’s front entry, the couple opted to have Copper Ledgestone™ natural stone veneers installed. The decking is Zuri® Premium Decking by Royal®. "The workmanship is very good, pleased to have the work completed. Everything turned out okay and looks great." - Bob D.
"It went great. Just as professional the second time as the first time." - Brian G.
"I would just like to thank everyone that was involved in the creation of my beautiful new deck. It is gorgeous!! The crew that worked on the deck was very efficient and kept the yard area clean. The talent and professionalism shown by all of the staff involved is greatly appreciated." - Beverly S.
"Lindus is an amazing company and they are so easy to work with! Their community involvement as a local business is top notch! Everyone is so friendly and was able to answer questions for me and my roof and gutters look amazing! I am so excited to not have to clean gutters ever again! They are very knowledgeable and caring about what they do! I would definitely put my trust in them to complete another project for me!" - Sarah P.